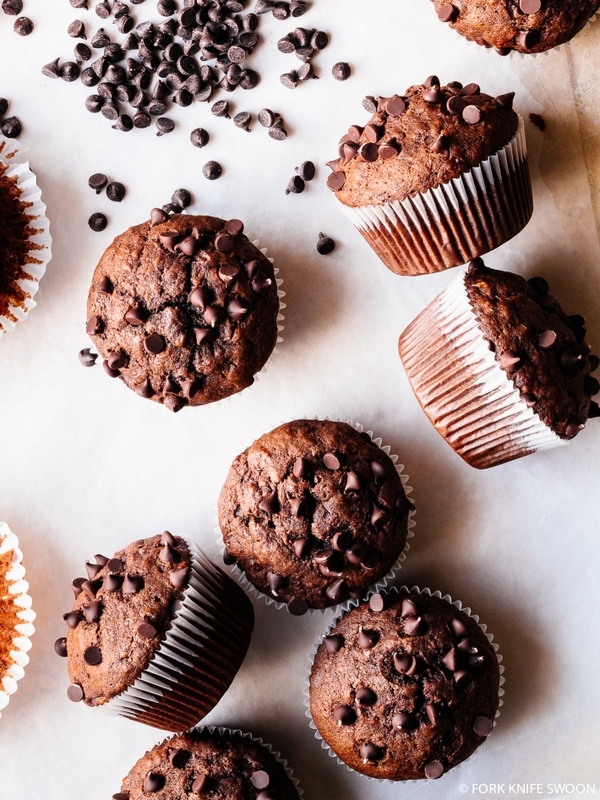 These super easy bakery style dark chocolate banana muffins are a sweet and indulgent breakfast treat, require just one bowl to make, and turn over-ripe bananas into chocolate-y bliss! I can be a bit of a tornado in the kitchen. Okay, almost always. I have a habit of using every spoon in the drawer. Every spatula and whisk. Teetering piles of dirty dishes and measuring cups sit, precariously stacked, in the sink and on counter edges, left in my wake as I cook and bake and generally wreak havoc on our kitchen. I know I should tidy up as I go, but rarely do, distracted by the whole wonderful process of stirring and measuring and tasting. So the fact that these chocolate banana muffins require only one mixing bowl to whip up means that I have no excuse; Even I have a hard time creating an enormous mess with this recipe. The dishwasher gets a brief reprieve. And these muffins! These aren’t really breakfast muffins in the traditional sense, although who am I, really, to preach about appropriate early morning choices after this post? 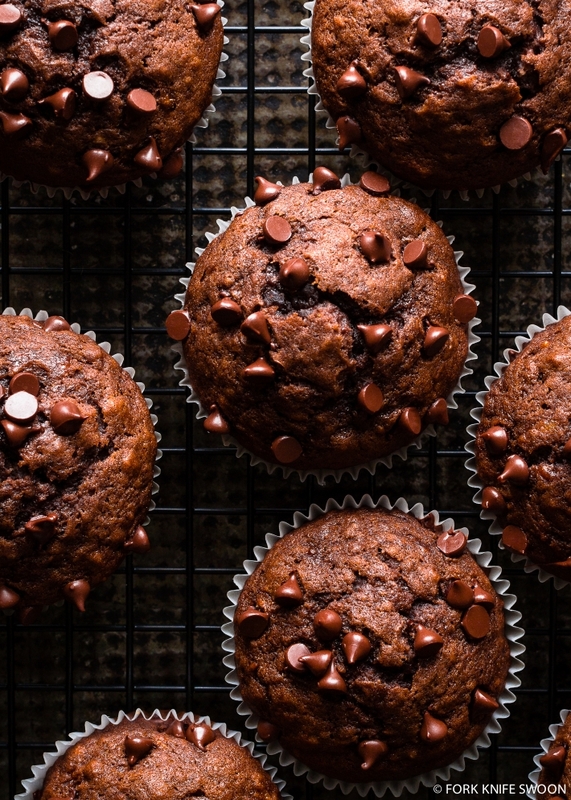 These chocolate banana muffins are more indulgent than an everyday breakfast though. I call them muffins, but they could easily be considered cupcakes. I think of them as special-occasion muffins. Welcome-home-you-had-a-long-day muffins. 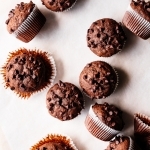 Sweet-afternoon-moment muffins. I-love-you-just-because muffins. 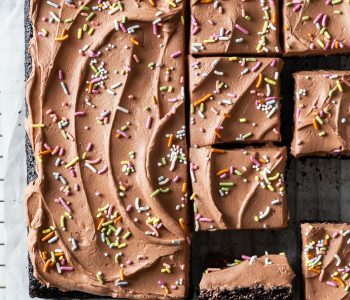 At any rate, all it takes is one bowl (and a smattering of measuring spoons) and you’re on your way to dark chocolate banana bliss… A messy kitchen not included. 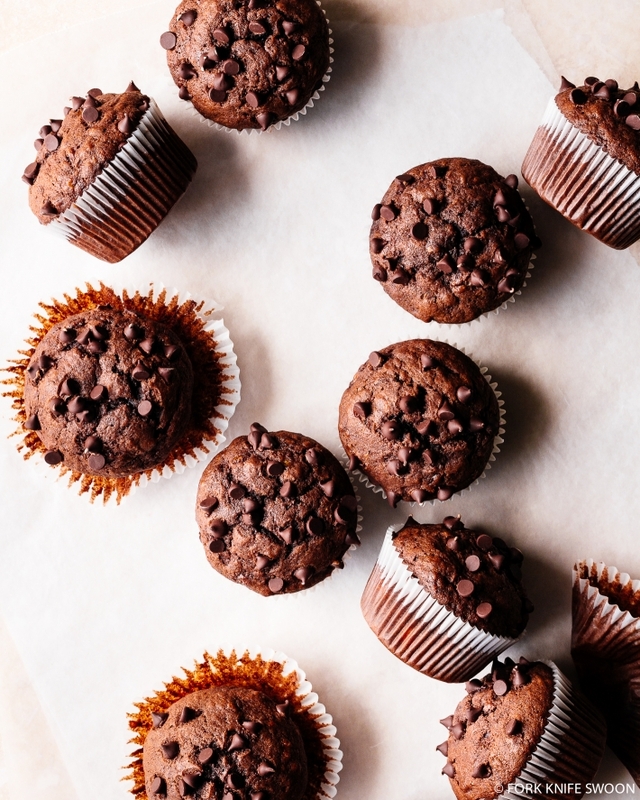 I’ve made these muffins about seven or eight times over the last year and they are AMAZING. They never last long with my kids! Hi, Karen! They definitely taste like banana. And for the most intense banana flavor, I’d recommend using super ripe bananas. Enjoy!! For the first time did I get baking with bananas so right !! I just replaced the almond milk with normal milk since that’s what I had on hand . But the result was still gorgeous super moist muffins . Can I use water in place of milk? Hi Kat! I haven’t tried it and I wouldn’t recommend it. I’m worried you’ll lose the flavor that milk provides. You can use almond or another non-dairy milk though if you prefer. Enjoy!! 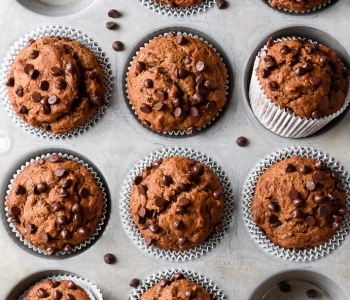 I have made this recipe twice and the muffins turned out amazing! I used coconut sugar, 1 cup plain flour, 2/3 cup spelt flour, olive oil and an egg replacer to make them vegan. The texture is so soft and fluffy! And not sickly sweet like a lot of other muffins, which is great. Thank you so much for the recipe! I get too excited about these muffins… They’re SO GOOD. I can barely leave any for school the next day! P.S. I make them VEGAN! Thanks, so much J! I’m so happy to hear that! 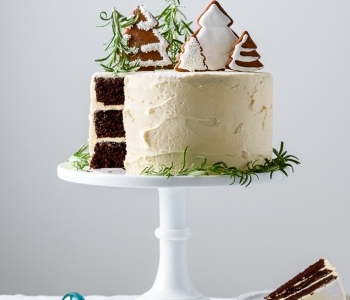 How do you pin this recipe? I don’t see any pinterest icons . Could I double the recipe with four bananas? Would I have to double the rest of the ingredients too? Hi Julie! 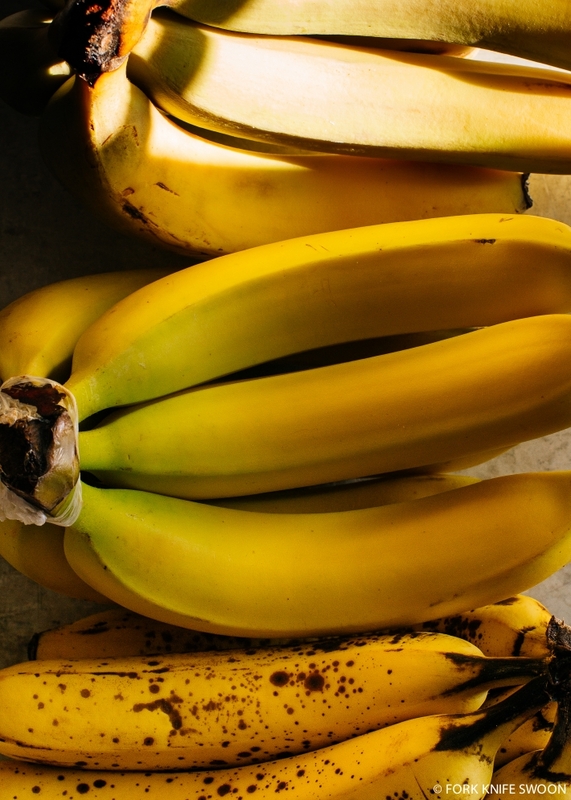 Yes you can definitely double this recipe – if you use four bananas you would want to also double the rest of the ingredients. Enjoy! Yum! 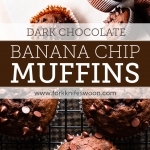 I love a good chocolate muffin and I love finding black bananas in my freezer for baking. The fact that this is a one bowl recipe…. 😍 Perfect for this busy mum. These look perfect! Just one quick question though, if I want to make these without the bananas, do I need to make any adjustments to the other ingredients? Just made these and got 43 (!) mini muffins from the batter! They are beautiful and have a nice dome. I only had skim milk so I added Greek yogurt for the extra tablespoon (just because it made me feel better). Added chips to the batter and sprinkled a few on top as well. My mini muffin pans are dark, so I baked at 350° and they took 13 minutes. Just popped one in my mouth and holy moly: how divine to taste both the chocolate AND the banana! Hope they freeze well because these babies are going into the freezer until Mother’s Day brunch on Sunday. 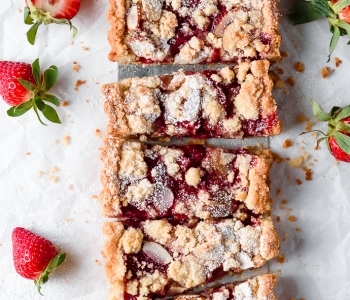 Thank you, thank you for such a simple and foolproof delicious recipe. I’m a “tornado” baker as well. This one-bowl recipe helped immensely! Awesome! Really great. Here are some of the switches I made, in case the substitutions help anyone else out: I always use coconut oil instead of canola (same proportions), used half all-purpose/half whole wheat flour, used 2/3 cup coconut sugar instead of white (much lower glycemic index), and left out the chocolate chips altogether. I also made 24 mini muffins instead of 12 regular. Same baking temp and time. The texture of these is so good. My kiddos are going to love them. Your muffins are delish! Soft, moist and yummy. Thank you for the recipe, definitely a keeper!